Today's post is my first as part of a fun baking group that I recently came across called "Baking Partners". Read all about it and join up here. The idea is a small group of people come together and improve their baking skills by targeting a common recipe / technique each month. I loved the sound of it and immediately signed up. Thank you, Swathi, for letting me be a part of this group. Their goal for this month was attempting to make a New York Style Pizza from scratch at home. 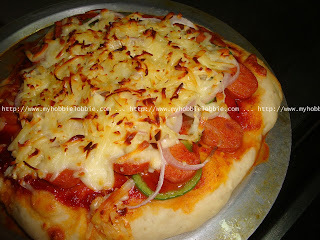 We love pizzas and I enjoy making them from scratch too and yet somehow, I've never blogged about if before. Strange, I know. I figured this would be a great way to add to my baking repertoire and I pretty much stuck to the recipe except for not using fresh basil in the sauce as it wasn't available. But I did instead add some mixed Italian herbs to develop a better flavor profile for the sauce. I halved the recipe and made 3 pizza pies of different sizes. This was enough for dinner for 2 with enough leftover for another meal coupled with a salad. It was a good learning experience and I can't wait to see what this group decides to bake next. 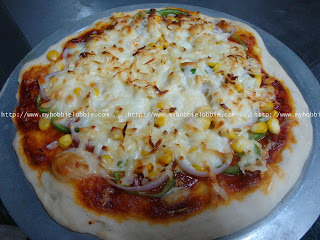 For now, here's a peak at the pizzas I made. They tasted wonderful and I was very pleased with the fact that it was made at home and not just ordered for. One thing that I will do the next time is pay more attention to presentation. Other than that, this recipe is great. This is the veggie one we enjoyed. Toppings include red onion rings, green peppers and corn. I used a combination of Mozzarella and Cheddar cheese. Here's a snapshot of the non-veg version. Toppings include red onion rings, green peppers and spicy pork sausage slices. I used the same combination of Mozzarella and Cheddar cheese for this one as well. Place the flour on your workstation. Make a well in the center and place the yeast, sugar and water in the center. A water gradually and work the flour from the center working in a little bit of the flour at a time, till all the flour is used up. You may or may not need all the water. When you've got a soft, pliable dough, place it on one side. Spoon the salt on the workstation and pour the oil over the salt. Rub down on it using the base of your palm. Work the oil into the dough. Round it off to a smooth ball, cover with a damp cloth and keep aside in a warm place for about an hour or till the dough has doubled in size. In the meanwhile you can start working on the sauce. Tip in the garlic and saute for a few seconds to release the aroma. Tip in the onion and saute till the onions have softened. Tip in the spices and herbs and stir it in. Add the tomato puree and stir in. Let it simmer for about 10 minutes. Season with some salt, pepper and sugar. Stir and let it continue simmering till it thickens and the flavors develop, about another 15-20 minutes. Be careful to not burn it. Check on the sauce at about the halfway mark. If you're happy with the flavors, take it off the fire. Lightly drizzle some olive oil on the baking sheet and spread it on the pan. Divide the dough into 2-3 portions. Roll into balls and using your fingers flatten it out to form a disc, keeping the outer edge a little thicker. Drape the dough over your knuckles and gently stretch till the crust is about 1/4" thick. Place on the greased sheet. Spread the sauce over it. Add your toppings and finally the cheese. Bake for about 10-15 minutes till the cheese is all melty and has a few brown specks on it. Take out of the oven, slice and serve hot. Note: The original recipe has you rest the dough for about 24-72 hours. But when I did that the last time I made pizza, I was treated to a big disastrous mess in the fridge. So I made these the same day. Yummy! Nice choice of toppings, Trish! Pizza looks good, I made mine with the same recipe source too. Mmm... the cheese looks awesome! Delicious Pizza Trisha, I like your various topping. It's in fact very complicated in this busy life to listen news on TV, so I just use world wide web for that purpose, and obtain the hottest information. That seems to be great recipe. My kids love pizza and I would surly prepare this for them.